A number of pelicans survived the devastating series of storms in December. 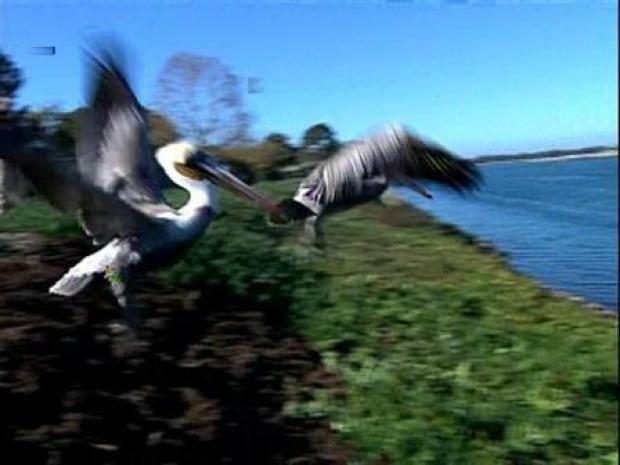 Several brown pelicans that arrived weak and malnourished weeks ago are back out in the wild thanks to local volunteers and veterinarians. SeaWorld staff released eight brown pelicans Wednesday after nursing the group back to health. The string of storm systems in December disrupted the feeding pattern for many pelicans up and down the coast of California according to the vets. SeaWorld normally receives a handful of pelicans needing help each December but last month they took in about 30 birds according to a park spokesperson. “Pelicans are washing up on the shores and entering the harbors weak, malnourished and dehydrated,” said Christy Simeone, Supervisor of Birds at SeaWorld. Vets and staff of SeaWorld release a group of brown pelicans rescued and rehabilitated at SeaWorld after a devastating series of storms in December. People who find the pelicans bring them to SeaWorld where vets have the staff and facilities to bring the birds back to health. The flight cages at the park help the pelicans regain their strength. The time it takes to rehab the birds depends on their condition when they arrive. It normally takes a pelican about two weeks in hand to recuperate. Each bird is identified with a band that is removed once they are released. Researchers marked the birds released Wednesday on their bill pouches with an ink pen. They hope the birds will reconnect with other pelicans in the area – like the large colony known to live near La Jolla.